Tickled Tarot-Death by Dodgeball | Wisecrack Zodiac: Your Snarky Guide to the Stars! Funny thing about the Death card; people always get spooked when they see it, probably because of too many bad B-movies involving fortune tellers in tacky tents with cotton candy stuck to their crystal balls. 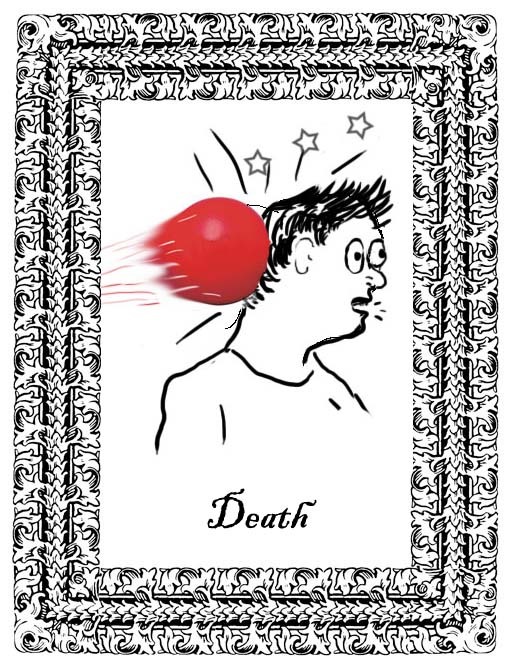 But the Death card is like a dodgeball streaking toward you. It’s gonna change your life, your outlook, or at least the way you breathe for a few hours. The Dodgeball zooming toward your head, or, face-up, can cause sudden transformations in your life, like the ability to see stars or pick up Mexican radio stations with your neck brace. Sometimes the impact makes your life better. Since you’re missing a tooth, you look ‘cool’ and ‘dangerous.’ And ‘lispy.’ Of course, it can also just mean getting thwacked in the brainpan and losing all that algebra you just learned. If you see Death by Dodgeball roaring in below the waist, or reverse, JUMP! If you’re fast enough, you can grab it and tag out the little piss-ant that threw it, then brag about your victory over lunch. But if you’re too slow, well, you’ll have a very interesting cast to explain to everyone and you’ll be involved in many impromptu games of ring toss.